Always keep your favourite memories alive with a personalised iPhone X case. Make your own iPhone X case now! 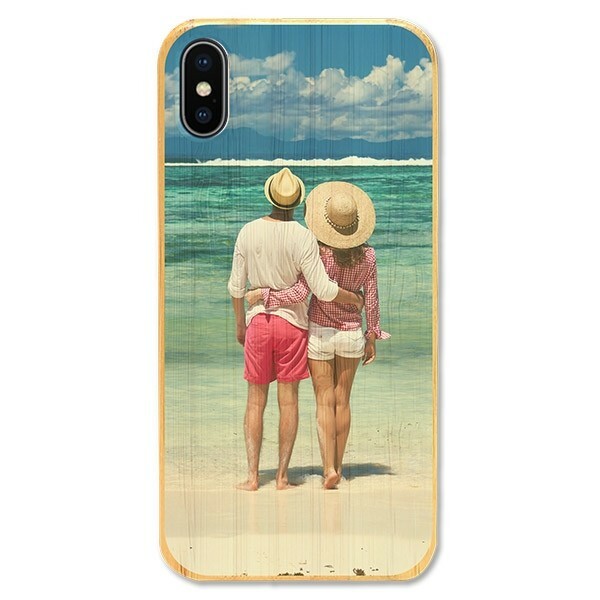 Design your own iPhone X wooden case with your favourite picture! If you want to transform your smartphone into a real eye-catcher, a personalised iPhone X case made out of wood is the perfect choice for you! Our durable personalised wooden cases consist of two layers. An outer layer which is made out of light but durable bamboo and an inner layer made out of high-quality rubber, which ensures great protection. We use state-of-the-art technology to print your design on the wooden surface to attain long-lasting results of high quality. How to make your own phone case? The design options for your own personalised iPhone X case are endless. You can either use your favourite picture, a cool design, a logo or an inspirational quote. It’s entirely up to you! To get started, you need to upload your chosen design to the customizer. This can be done either directly from the device you are using or as an import from a social network such as Facebook or Instagram. When you place your picture on the case, you need to pay attention there is enough space around the openings. The design tool also offers many different editing functions that you can use for the finishing touches. Once you are happy with the way your personalised iPhone X case turned out, you can proceed to checkout. Before confirming your details, please make sure to double check all of your information. It is not always possible for us to make any changes afterwards since your order will be shipped as soon as possible. We ensure a fast delivery service by making sure that a member of our production team starts producing your personalised phone case almost immediately after purchase. Within 24 hours, your new favourite accessory will already be on its way to you!